Darwin is an amazing destination and a hire car booked through our website provides you with the ultimate ability to explore the region at your own pace. We make it easy to find the perfect car hire in Darwin. Compare deals from leading rental car companies such as Budget, Avis, Hertz, Europcar and Thrifty to find a vehicle that best suit your budget and preference. The city is by far the largest and most populated in the sparsely populated Northern territory. Yet it's still the least populous of all Australia's capital cities. With so much to see and do in Darwin, it really pays to book a rental car. Not only does a hire car offer you the sense of freedom of being able to pick up and go whenever you please, it also means that you don't have to plan your day around public transport. Moving your shopping back and forth, visiting Litchfield Park and maybe heading further afield on a road trip is so much easier. The options are endless when you book a a car hire in Darwin. Why rent a car in Darwin with CarHire.com.au? Get the best deals: You will get the best price and car selection available if you book your rental car as soon as you know you will need one. Save time: Using CarHire.com.au offers you the best service in the rental car business. You don't have to spend hours looking on multiple websites for the best rates amongst the top rental car companies in Australia. Convenience: We have several car rental pick up and drop off locations in Darwin and in nearby cities which makes it easy to find one nearest you. Outstanding customer support: Our high-motivated customer care representatives are experts when it comes to your car rental needs. Contact us today. A trip to Darwin is guaranteed to be a uniquely Australian experience for any traveller. The city is unique compared to other Australian capitals. One way to appreciate the history of Darwin while you're touring in your rental car is to book a Bombing of Darwin tour. Darwin acts as the Top End's regional centre and is an absolutely fantastic destination if you want to see the real outback. The best way to explore the region is in a sturdy, outback-proof rental vehicle. Darwin is one of Australia's most modern and multicultural cities and its proximity to Asia makes it an important gateway to countries such as Indonesia and East Timor. Do your research when travelling here as there are very distinct wet and dry seasons and this could influence your choice of rental vehicle and booking time. You don't want to make a mistake and hire a car inappropriate to the climate. Day trips are a popular way to explore the region especially for travellers who have booked a rental vehicle. 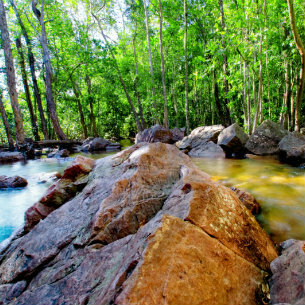 Some of the most popular day trips from Darwin include the much loved Litchfield Park. Here you'll find weathered, sandstone escarpments coupled with patches of rainforest and waterfalls. Keep an eye out for interesting sights such as 'magnetic' termite mounds and breathtaking crystal-clear water holes. 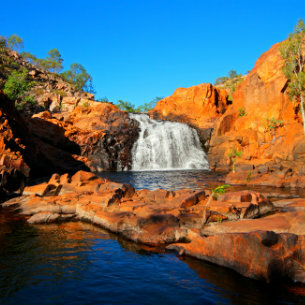 Visit Kakadu, Yellow Water and, for something different, the Aboriginal-owned Bathurst and Melville islands (these are a thirty minute flight from the town). There are also plenty of organised tours you can book, taking the hassle out of co-ordinating them yourself. Sometimes a group tour is the easiest and most time-effective option. Remember though - you can't spend all your time in Darwin behind the wheel of a carhire.com.au rental car...no matter how cheap or luxurious it is! If some intense relaxation is what you're after then why not consider a trip to one of the day spas. The Tropical Spa is a stunning retreat in Darwin catering for beauty treatments and simple relaxation. Whether you need your eyebrows reshaped or a whole half day package you'll find what you're looking for. With plenty of parking space, just park your rental car up and sink into the relaxing treatments on offer. For a local experience, Howard Springs and the Parap Village Tavern both offer trivia nights with great prizes. Or you could watch a vintage outdoor movie at the Deckchair Cinema. Some of the most popular items on travellers' itineraries include dinner and drinks at the Darwin Wharf Precinct or sunset cocktails at Casuarina Coastal Reserve. A visit to the Mindil Beach markets for a spot of shopping and poking around is an absolute must for the shopaholics amongst us. A cheap and fun way to entertain the family is a picnic in the George Brown Darwin Botanic Gardens.